Users can make boring presentations a thing of the past with Prezi. This online presentation platform has been used to make fun and creative presentations in commercial and academic environments and owes its popularity to the innovative ways it conveys points across. With Prezi, users can zoom in and out, turn and pan at unique angles and directions, and even make elements fly across the screen. Prezi can give a presentation a cinematic feel that increases audience engagement and keep them glued to their seat. With Prezi, presentations are built on a wide digital canvas. Points are drawn spatially, which encourages creativity as presenting these points can then be made either by zooming in or out, or panning from left to right. 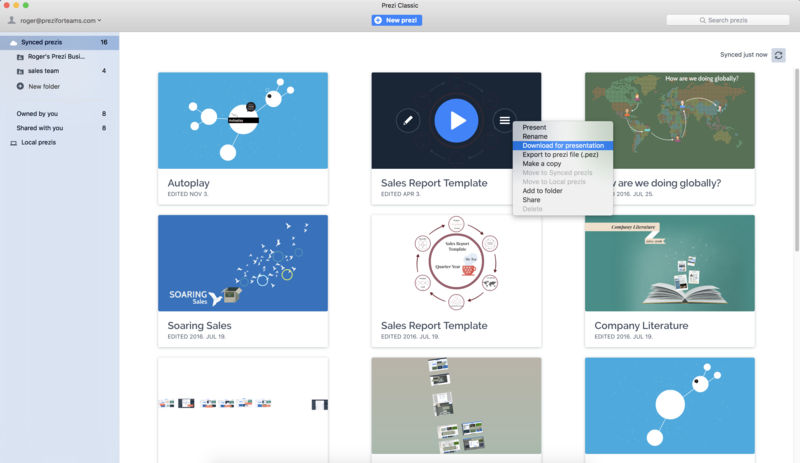 Users present the way they want with Prezi, exercising full control over the font size, images, angles, and all other aspects. Templates available in Prezi give users a good starting point but still allows them to be flexible and creative. Best of all, users do not need to worry about a steep learning curve as Prezi is straightforward and user-friendly. No matter their skill level, users will be able to create visually appealing presentations. All of this results in a presentation that your audience understands, whether it is for marketing, collaboration, or just to send out a message.